We are currently in our historical fiction book club unit and have been reading various historical fiction picture books and chapter books during read aloud - click here to read my posts on our historical fiction unit. 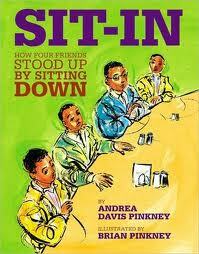 One of the books we read aloud and loved was Freedom on the Menu: The Greensboro Sit-Ins by Carole Boston Weatherford so I was excited to find a companion text to read aloud titled Sit-In: How Four Friends Stood up by Sitting down by Andrea Davis Pinkney and Brian Pinkney. 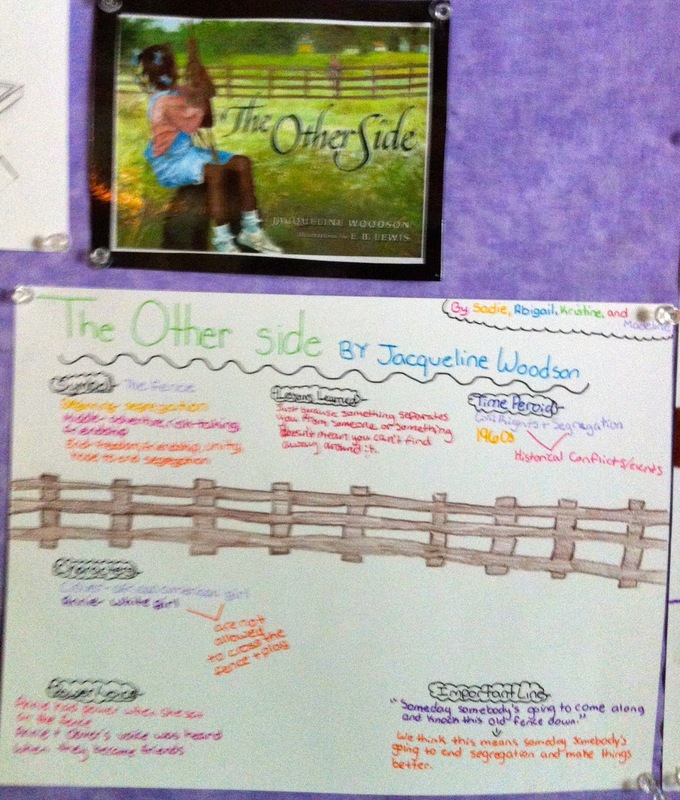 This is a great book to read aloud and compare to Freedom on the Menu to discuss similarities and differences on how the two books shared the story of the same situation. One of my favorite parts of the books is the detailed Author's Notes and the large timeline of important events in the back of the book. 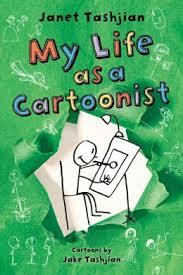 In my classroom, we are also fans of the My Life as a... series by Janet Tashjian and were so excited to buy and read My Life as a Cartoonist when it came out this month! This series is perfect for reluctant readers and readers who enjoy and benefit from illustrations to help them understand vocabulary too. The idea of having sketches in the margins throughout this series, to help define vocabulary used in the story, is brilliant! 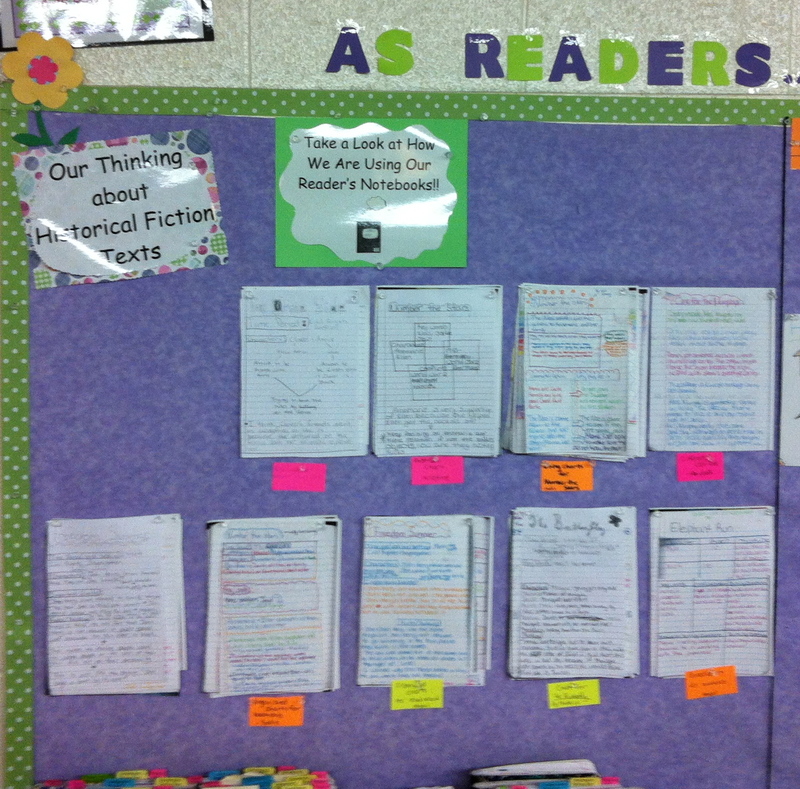 It not only helps readers navigate through some vocabulary, but also makes it fun to read too! Thank you Janet Tashjian for continuing to add books to this series! It's Monday! What Are You Reading? How-To Books! 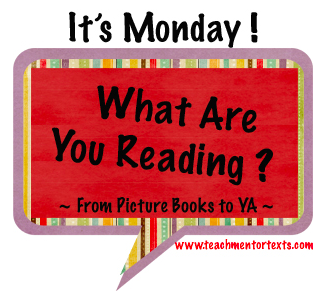 One of my favorite Monday morning routines has become checking out the links at teachmentortexts.com to find out what other bloggers are recommending to read. I have many saved pages that I return to whenever I am at the library or bookstore. Feel free to join with your book recommendations. I read this one over the winter and at first, I wondered if it would be too abstract, since it is not clearly procedural as cookbooks and science experiments are. However, I keep coming back to it and I think that it would be a useful mentor text to show children how they can write about a person within a how-to construct. 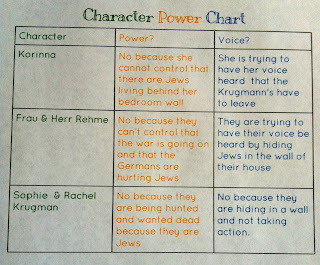 Thank you to Carrie Gelson for bringing this one to my attention. The publishing date is May 30 and I have been exploring all of the previews that I can find on line with five copies in my shopping cart. How to wonder, be brave, and see the breeze are topics that are described. I can't wait to see how it inspires children. How To Make Bubbles by Erika Shores is one of the Puffin Plus series of procedural writing and it is perfect for teaching younger students how to be explicit in their how-to writing. Great pictures and clear, simple language should work really well to inspire our younger students, especially. Another video I watched to go with this unit is about blowing a bubble with gum and the format is exactly what I hope that some of the students create since the narrator goes through clear steps and descriptions, including some warnings! TIP: If you insert the word quiet before a youtube link, the ads disappear! I have a few cookbooks and craft books that we will use as well. If there are particular favorites anyone has out there, please share! Over the weekend, I have been working my way through the first of the new Units of Study from Teachers College that arrived this week. Talk about amazing how-to books. 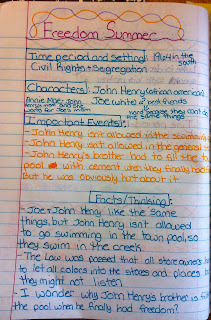 Each grade has its own set of spiral bound books that accompany writing units. From Scenes to Series by Mary Ehrenworth and Christine Holley is in the first grade collection and it contains nineteen sessions that describe workshop instruction. 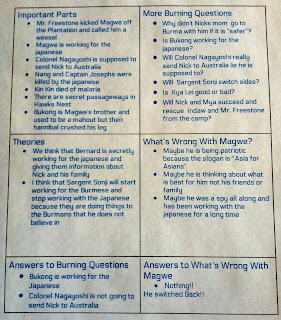 I am loving the language, work samples, teaching tips and resources that are included. As I've been reading this book, I have been keeping track of some of my favorite lines and descriptions and I will share them in a post that I am planning for later this week. Since we are trying to prepare students for Smarter Balanced Assessment that will begin in 2014-2015, fourth-graders across our district completed performance assessments over the last week. 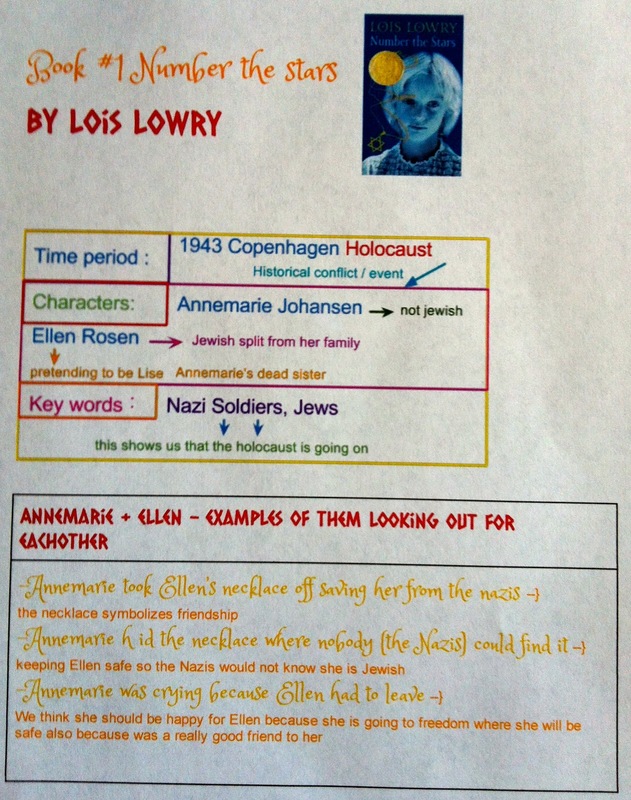 We used an assessment that Teachers College Reading and Writing Project designed. 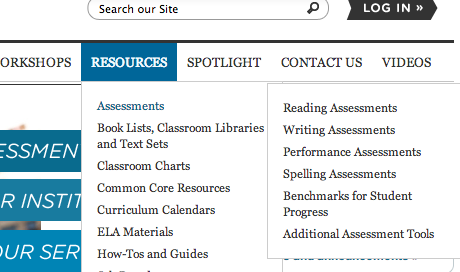 If you are looking for examples of assessments, their website contains several at various grade levels. 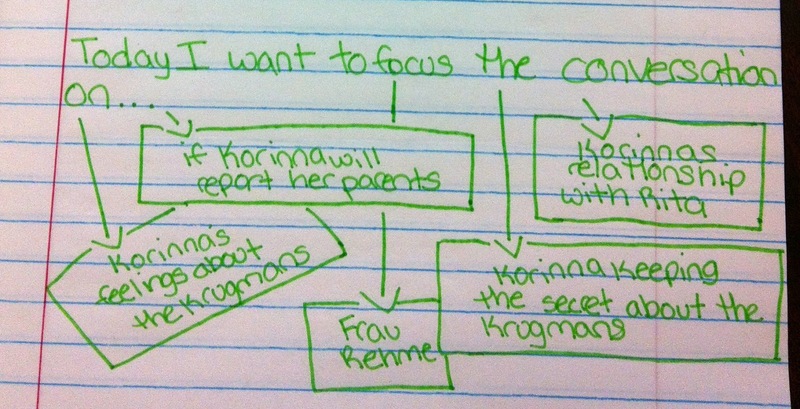 Taking notes from and gaining information from a video is difficult. Even though most of our students have had their fair share of screen time, they watch as passive participants without much debate, conversation or learning going on after sessions of screent time. Several students talked about the video going too fast for them to take notes. Some implications for instruction? We had at least one class watch the video once on the big screen and then individually on computers with the option of pausing. I'll be interested in talking to these students about their experience with the task. 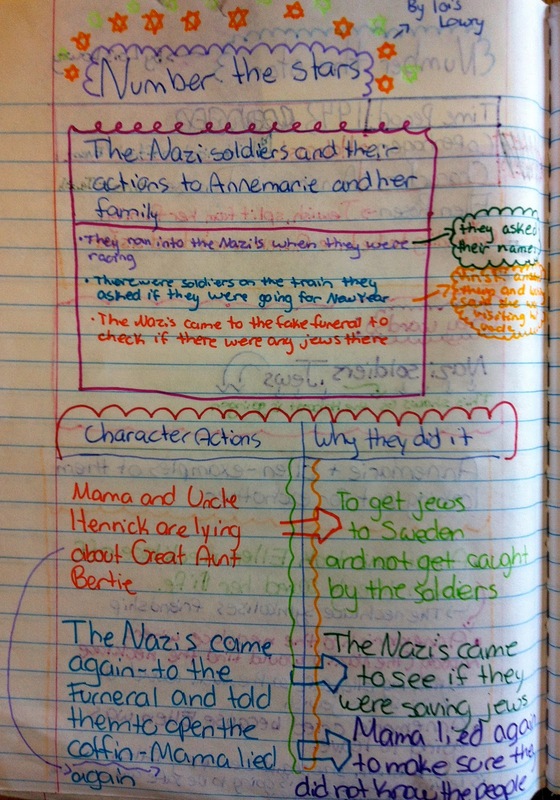 Students have to learn how to take notes without feeling the need to write full, perfect sentences. 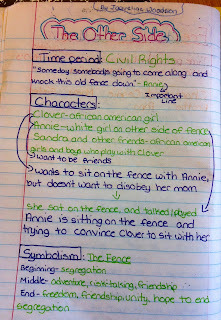 They have to develop an understanding of why we take notes, but for many students who are just mastering the skill of writing in sentences, this is really, really hard. Should the point of view of the makers be highlighted? Should video clips be neutral? Those would be hard to find for many of the topics that lend themselves to making claims. Should students be allowed as much time as they choose to stop and start the clip? With the pressures of on-line testing, districts should be acquiring the resources for this to happen...but are they? 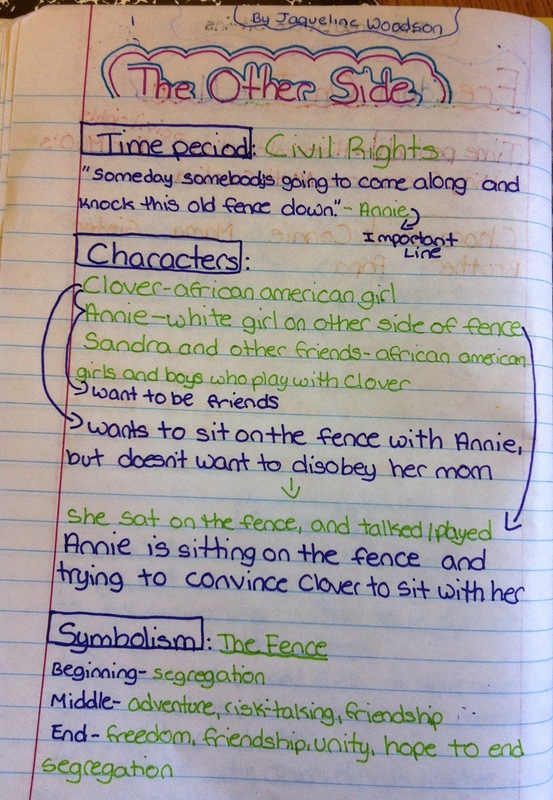 teach students that they should choose the side that has more evidence, regardless of their opinion. My teenage daughter is taught this strategy to prepare for AP exams but at what age are students really developmentally able to argue a stance that they don't support? And what about those of us who are so committed to teaching about purpose in writing workshop? For the assessment, you might need to assume a position with which you don't agree? teach students to be adept at addressing the opposing beliefs. (Some people think... but I think becomes an even more important thinking prompt to teach students). I'm sure that there will be much more to come as I reflect with the teachers about the unit and the assessment--we will be meeting in June to share struggles, strategies and celebrations. I'd really be interested to hear about other districts' experiences as I'm sure that we are not the only ones trying out these new assessments. As the district's new Writing and Social Studies Coordinator, I am leading the development of a whole new curriculum for the sixth grade social studies. To further complicate this challenge, we decided that we would integrate and embed writing instruction into content areas and reading. Throughout the year, I have met with teachers to develop essential questions, learning outcomes, and enduring understandings that mesh with not only the Common Core State Standards, but also with our state frameworks and the rest of the units in our district in different grades. 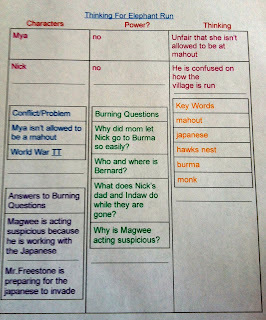 At this point, we have chosen resources and set up the units and yesterday, we met and began structuring a learning plan. At the recommendation of a colleague, I began the day by showing the teachers the Alan November TedTalk where he emphasizes the importance of purpose for students. He told story after story about the quality of work students of all ages created when they felt that their work had purpose. Because one of the end-of-unit assessments will be creating a travel brochure of one of the places we will study, some of us wondered out loud about linking up with a local travel agency to see if they would consider being on the receiving end of a multi-media presentation about Brazil, Tanzania, or Australia, the three places where we will focus our studies. 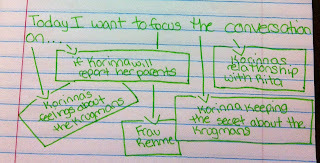 Today, I called a travel agency to see if they might be interested in using student work. As she understood what I was suggesting, she realized the potential win-win scenario this could offer, since students could research and present parts of these countries that she doesn't have materials about. She was not only interested in receiving and using well-done presentations to show clients, she also is collecting resources and is willing to offer guidance and feedback to students about what sort of products would be useful for her business and how they could tweak their projects so that she might be able to use them. I am so excited about this concept and hope that we really do get to implement it in the fall, as what an amazing purpose for students! If anyone has seen this work or has other ideas for setting up authentic opportunities for students as they study geography, culture and interactions, I would love to hear about them. 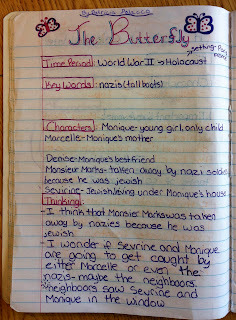 This month, students have been working hard in their historical fiction book clubs to read, think, write, and talk deeply about their historical fiction books. 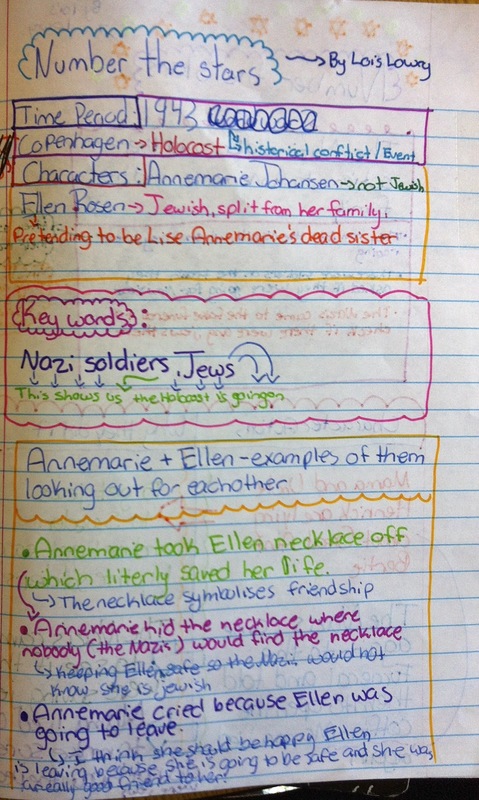 They have been creating charts and using a variety of note-taking strategies to help them prepare for their book club conversations that they have on Mondays, Wednesdays, and Fridays. 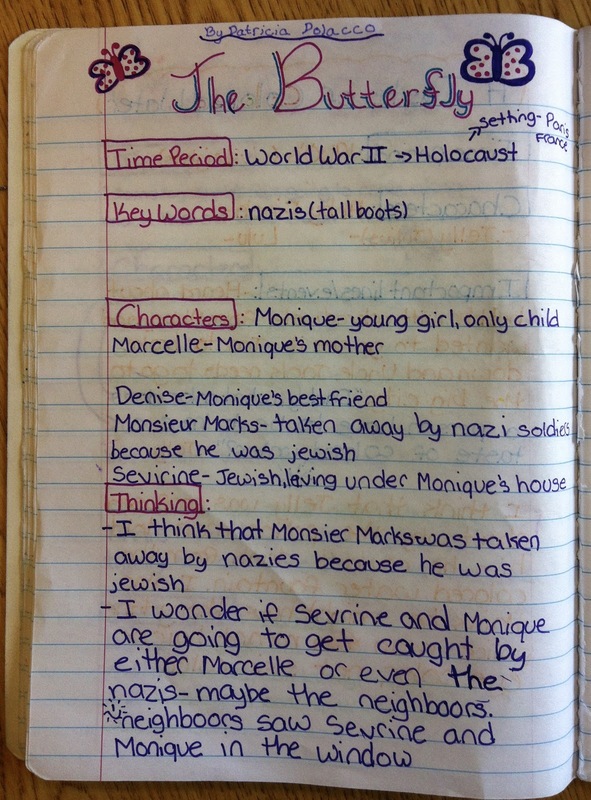 Students choose whether to write their thinking on post-its, in their reader's notebook or book club notebook, or use Google Drive to help them deepen their thinking and prepare for their conversations. On Mondays, Jen Vincent and Kellee Moye host What Are You Reading? 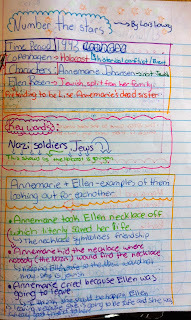 on their blog, teachmentortext.com. If you are ever in need of a book recommendation, this is a guaranteed place to find some! Over the week, I read a few great books. One of my favorites was Hey Little Ant by Philip Hoose and Hannah Hoose. This book was published in 1998 and was a Reading Rainbow selection that I had never heard of until it was mentioned by a favorite website of mine, learningtogive.org. I bought it for our kindergarten teachers and then read about it again in Non-Fiction Mentor Texts by Lynne Dorfman and Rose Capelli (another book I read over the last two weeks). If you haven't read Hey Little Ant, I highly recommend it for young children, as well as older students. Perspective and empathy are important themes in this book and it could serve as a launchpad to much more serious conversations about other people's lives-- I can envision Hey Little Ant inspiring conversations about not only animal rights, but also decision-making, peer pressure, human rights and social awareness. I also read Hold Fast by Blue Baillet which would actually work well with Hey Little Ant, since it is another book with strong messages about empathy, perspective, and social awareness. While I did not find Hold Fast to be as compelling as some other books I have read, I am glad that I read it and I think that it's important for educators and students alike to read about and learn about life in homeless shelters. 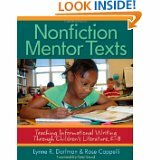 Non-Fiction Mentor Texts by Lynne Dorfman and Rose Capelli is now extremely tagged and noted. 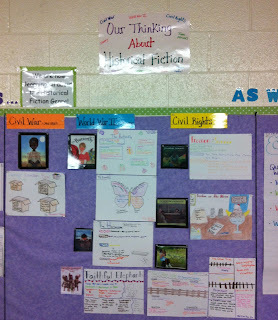 We have launched opinion writing units in several grades this year. Since these are new units, we do not have extensive lists of mentor texts or samples of student writing and this book provides both. 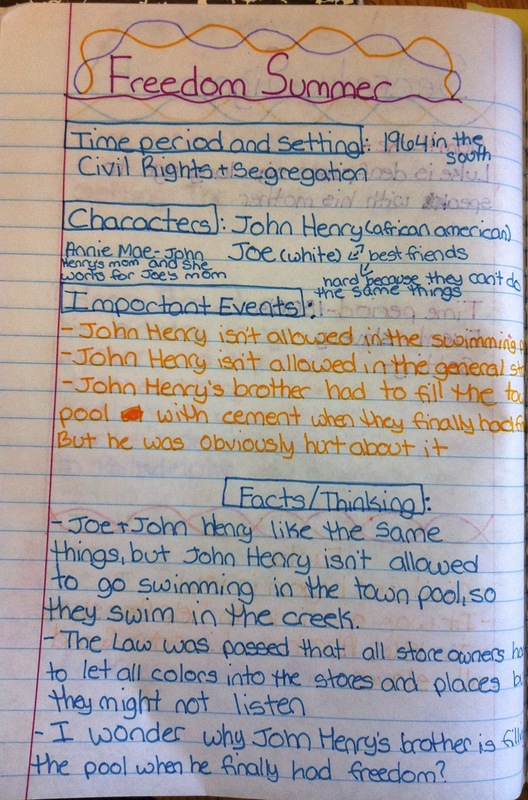 It also provides great teaching tips and lesson formats for other types of informational writing. 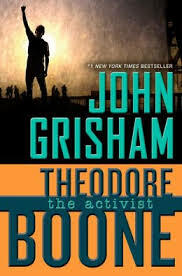 I have already read a few chapters multiple times and I am not returning this book to my shelf any time soon. 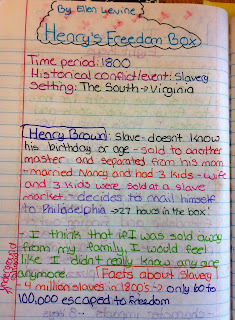 Also, I have to add that we are re-writing our sixth grade social studies curriculum and I have been reading every exemplar that I can find. The resources and the generosity of districts are overwhelming as every time I search, I find new materials to read and digest that have helped me plan and prepare for upcoming meetings where we will develop our units. Some of my favorites have been from the Greece Central School District, learningtogive.org, Discovery Education, Choices.edu and National Geographic, but really, these resources represent just the tip of the iceberg. So many times, I find myself listening to public radio and thinking how easily and powerfully it could intertwine and supplement some of our elementary curriculum. I admit, though, I have never gone back to the NPR archives. A few weeks ago, when I was at the New England Social Studies Convention, I met Monica Brady-Myerov. Monica has founded listenedition.com, a resource for educators that weaves public radio broadcasts with Common Core and State Standards. Working with public school teachers, Monica has developed and categorized many lesson plans with direct links to national and state standards. Each broadcast is about 4-5 minutes and comes with a detailed lesson plan, listening prompts, extension activities, homework suggestions, assessment opportunities. 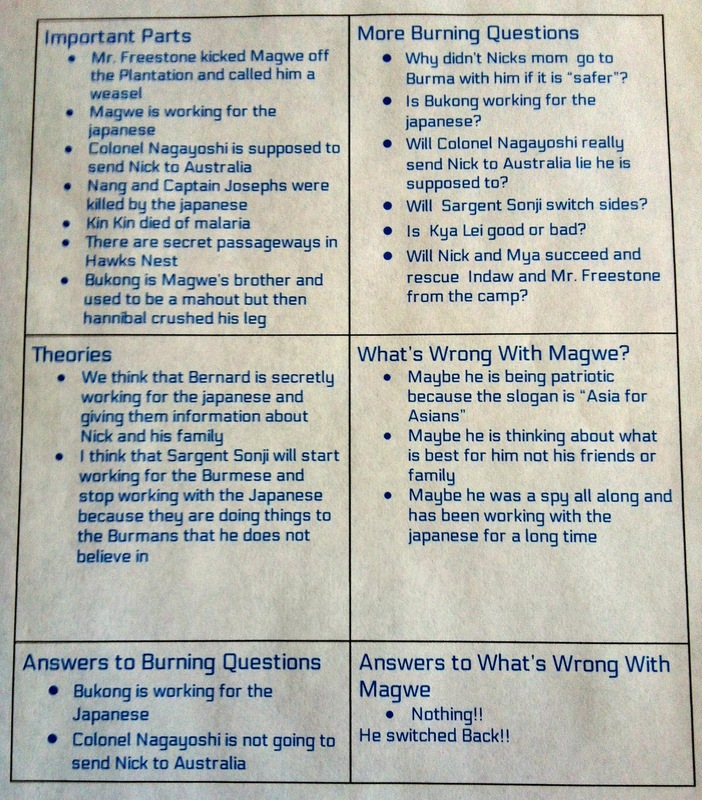 Additionally, the lesson plans have links to all of the standards that they address. Monica has done an amazing job at organizing this website to make it easy to search and find resources. 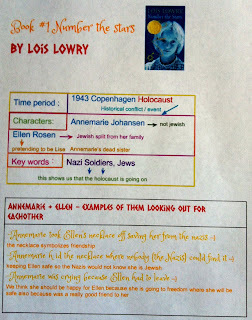 Lessons are organized by grades (3-6 and 7-8), as well as by subject. Some of the subjects include, but are not limited to, geography, immigration, the Civil War, STEM, mathematics, the Constitution, and Westward Expansion. 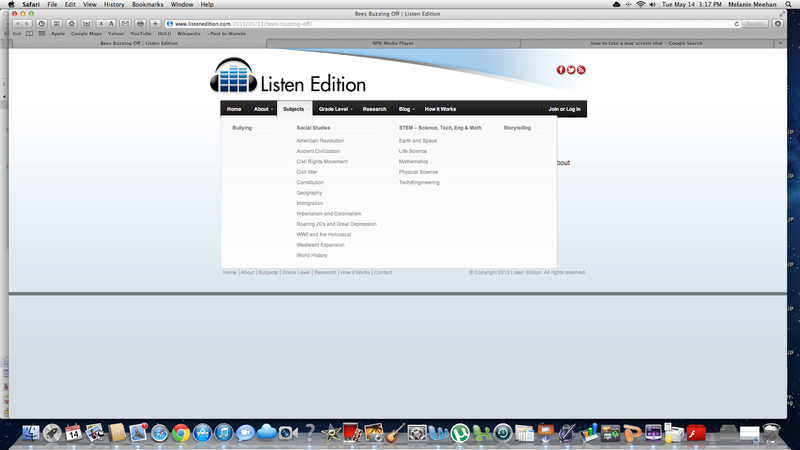 I have included a screen shot of the dropdown menu that gives an idea of how easy it is to search for lessons. 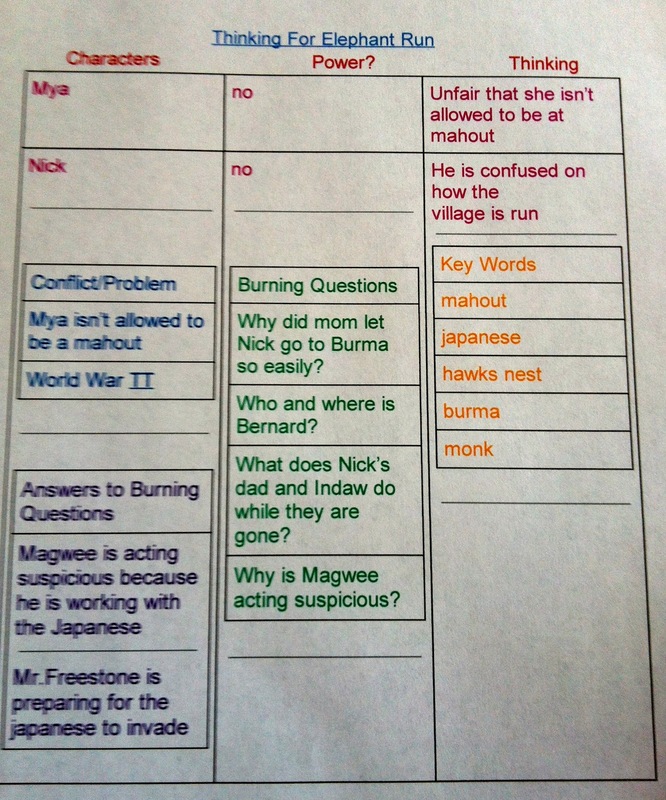 Monica has made it easy for teachers by including summaries of broadcasts, detailed notes on the transcripts, and specific questions with answers that accompany the broadcasts. At the convention, I spent time talking with Monica about the importance of listening and of increasing students' awareness of and curiosity about the world around them. From broadcasts about the noise of worms to others about border states during the Civil War, public radio is an amazing resource for developing or supplementing curriculum, especially at the middle school to high school levels. 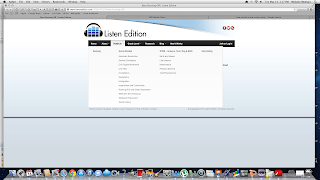 For the time being, listenedition.com is free. You do have to register in order to view the lesson plans and extension activities and I highly recommend that you do, as you will also receive updates about newly added broadcasts and lessons. Every Tuesday, Stacey and Ruth host the Slice of Life on their blog, twowritingteachers.wordpress.com. Please feel free to join this community by posting or commenting on any of the linked posts. Over the last few weeks, I have become increasingly involved in the Choose 2 Matter Community, a project started by Angela Maiers. Angela is challenging young people to develop projects that solve problems in our world--projects that they can manage that will make the world a better place. Until the middle of June, she is spearheading a contest for young people between the ages of 5-18 to submit quests that they have created to solve problems within their worlds, stemming from her conviction that we all matter. Angela's TedTalk is extremely powerful and one to watch if you haven't already. It's one of the longer ones--almost twenty minute--but definitely worth listening to or watching. 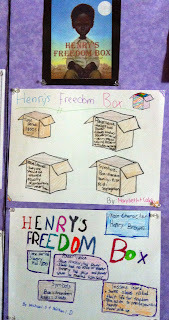 Her translation of this work for young people can be found on the website choose2matter.org. While she is challenging hundreds of young people from around the world to submit quests, she has also created a system for young people to help organize the program. Through social media and connections, she has established teams with adult facilitators for storytelling, creating multi-media projects, using social media, and evaluating quests. I heard myself say yes to being the adult facilitator for the story-telling group and I have already been so impressed with the energy of middle school students from around the country to help get the word out about this project. spread the word through social media. As more information comes up about choose2matter.org, please help relay the news. spread the word to your students and teachers.This project could work really well with some of the opinion writing units that are going on in classrooms. Maybe we could generate energy for submissions of quests. If you can think of other ways to support this initiative or to become involved, please share them! Thanks to Angela and her team for inspiring us all with such simple words--you matter! I am a huge fan of the Lunch Lady series by Jarrett Krosoczka so I was excited when I heard that he was coming out with a new chapter book series! 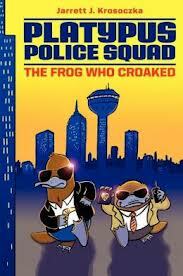 Platypus Police Squad: The Frog Who Croaked is the first book in the series and it just came out last week. We were counting down the days to its publication in our classroom and immediately there was a list of students who wanted to read it. I highly recommend this book and can not wait till book two comes out...hopefully it won't be too long! 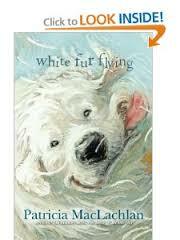 This book and series will be a new favorite in classrooms - it is humorous, suspenseful, and mysterious. In CT, we have the Nutmeg Book Award each year and have a variety of chapter books as the nominees. 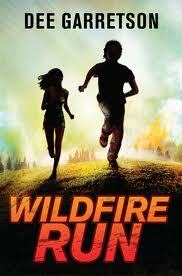 The 2014 nominees became public last week and Wildfire Run by Dee Garretson is one of the nominees. The back blurb immediately drew me in and once I started it, I couldn't put it down. In this story, Luke's father is the President of the United States and is currently vacationing at Camp David with one of his friends, Theo. Luke has Secret Service agents following his every move to protect him. While they are at Camp David, there is a huge earthquake in another state and a series of wild fires too so the President needs to head back to the White House. Luke stays at Camp David with his friend and the Secret Service agents and they are having fun until there is a raging wild fire in the woods and it is quickly approaching them. All of a sudden the tides are turned and now Luke must try to help the Secret Service agents and try to get all of them to safety. Enjoy! 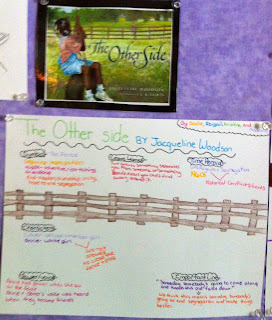 To read my first post about our Historical Fiction Book Club Unit, please click here. Students have been working hard these past two weeks to internalize and apply the skills/strategies I am teaching in mini-lessons into their book club books and conversations. 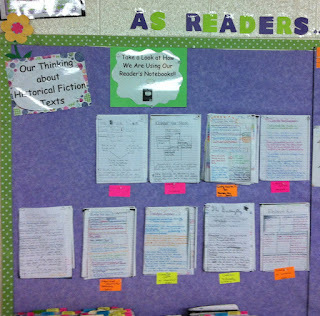 Since read aloud is an extremely important part of our day as a class, a lot of my modeling for writing and talking about reading occurs through read aloud. 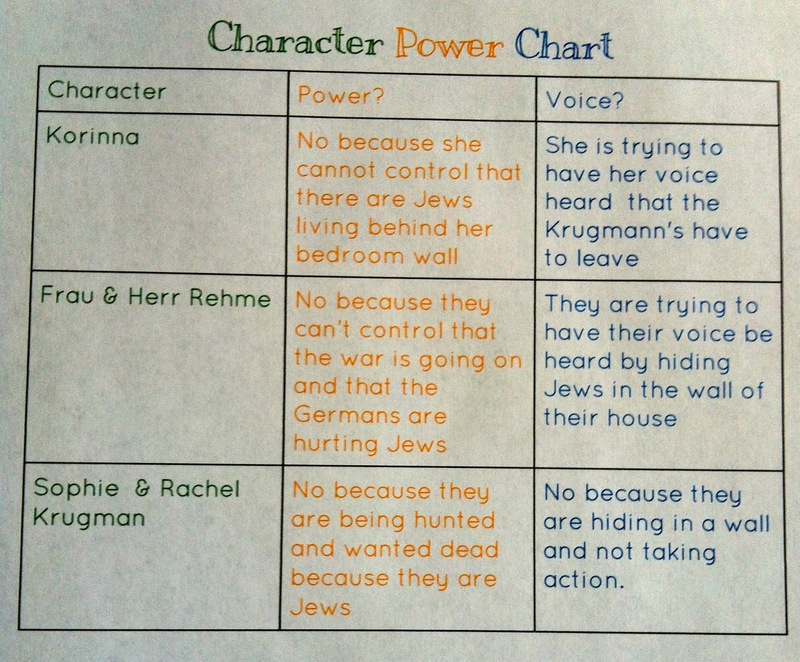 Students have been watching me make different charts for each read aloud since the first day of school (and we have read A LOT of books) so they are "chart experts" themselves at this point and we are all learning strategies from one anther on ways we can keep track of and extend our thinking. At the beginning of our historical fiction unit, I read aloud about eight different picture books to expose students to various historical conflicts and time periods to help build their background knowledge about time periods they may be reading about in book clubs. 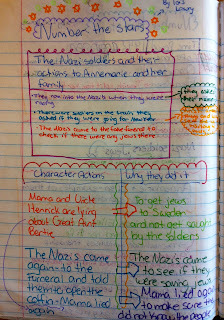 As we read and discussed these historical fiction picture books, students created their own charts in their reader's notebooks as they do during each read aloud, but they also had some time to create mini-charts as a small group/partnership to showcase their most important thinking about one of the read alouds. This past week, in my morning message, I gave students the option of working on a mini-chart for a read aloud with a small group/partner until it was time for morning meeting. Most students opted to create at least one and loved doing it! 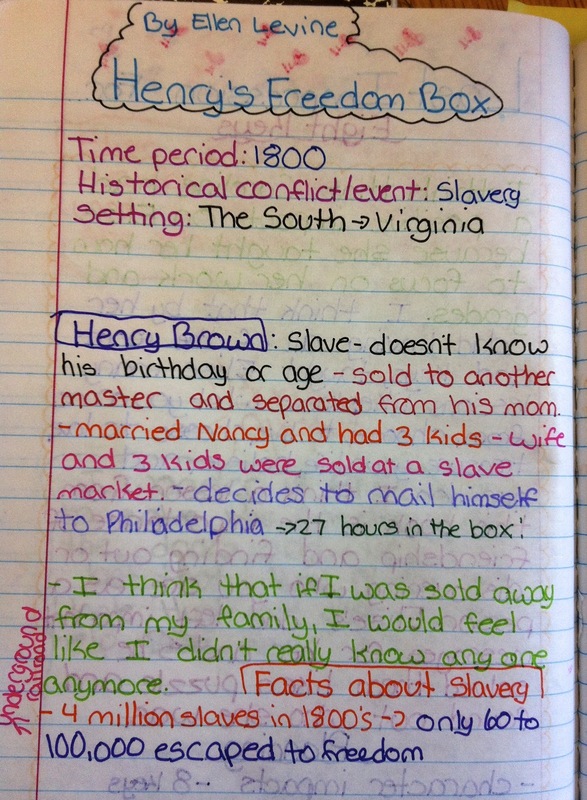 These mini-charts gave students an opportunity to collaborate with one another, determine what information/thinking was most important since they had limited space on the paper, and allowed them to express their thinking through sketches as well as words. 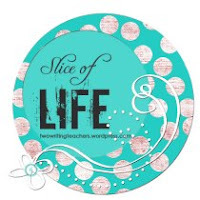 Slice of Life is hosted by Twowritingteachers.wordpress.com. Thank you to Stacey and Ruth for the inspiration and motivation to share our slices on Tuesdays. Tony Wagner writes about the importance of play, purpose and passion in his book, Creating Innovators. I have written about his work before and I have watched his TedxNYED about it, as well. If you haven't gotten a chance to watch this talk, it's fifteen well spent minutes. Last night, I got to see the power of play, purpose and passion when the three intersect in children's lives. We honored the Robotics team at our Board of Education meeting last night. They had won a major award in a competition and the coach had received a major honor as well, so it was appropriate to have them come to a meeting. Twenty-two high school students spoke about their experiences on the team and here are some of the snippets of what they had to say. "What we do makes a difference. We see the effect of our work right away so we know the purpose." "It's fun. We always are laughing and having a good time." "Even after people graduate, they come back to see what's going on. It's their passion." Many other comments reflected these themes, but these three comments so clearly showed the power of Tony Wagner's three p's. Literacy dominates my world and I am trying hard to weave passion, purpose and play into the academic days of students as they read and write. Through our workshop instruction, we offer students choice in reading, which certainly increases the chances of passion for their reading, while writing workshop emphasizes purpose. However, I am sure that we could do better and I would love to hear how others incorporate passion, purpose and play into their literacy instruction.